Every citizen has an equal right to obtain equal education at basic levels and the government shall establish a general and universal education system throughout the country. The education principles aim at training people, equitably and according to their capacity, to enable them to earn a living. The new constitution promulgates a compulsory education for nine years and a quaranteed quality education for all Cambodians. There will be a restructuring of the educational system from eleven years to twelve years of schooling. The Cambodian education system is a complete one, from pre-school (3 years), primary school (6 years), lower secondary school (3 years), upper secondary school (3 years) and tertiary education (4-7 years). 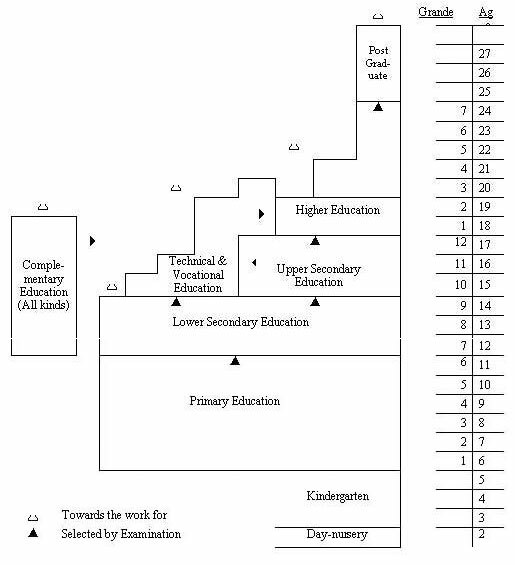 (Chart of national education system attached). Vocational and Technical Education and training is conducted from 1 year to 3-5 years. Non-formal education also contributes to the training of citizens. The educational system is primarily defined by an overall governance structure. The educational system is heavily decentralized with three levels of governance responsible for its management At the central level, the Ministry of Education, Youth and Sport (MOEYS) has overall responsibility for establishing national policies and curriculum guidelines. Some tertiary institutions and vocational and technical secondary education institutions are under the governance of other technical ministries (Ministry of Agriculture, Health, Labor, etc.…). The other two levels are the provincial and district administrations. The MOEYS in the future will not only formulate the national policies but also the budget for all provinces, and will ensure that all local educational authorities spend their budgets and implement educational development projects within the national policy framework and budget allocation. All kinds of privates schools are allowed to operate according to the curriculum development approved by the Ministry of Education, Youth and Sport.